Happy Friday, everyone!! I wore this look on my birthday last weekend to get breakfast with my family (you might’ve seen this post on my Instagram or my sister’s super glamorous post here ;)!!! As a mama, an outfit like this is my go-to uniform most days and this specific look has been on repeat a lot lately. Everyone needs a comfy sweatshirt, a good yoga pant and cute sneakers! I definitely have to get this sweatshirt! It looks so cute paired with the yoga pants and matching sneakers. I also love the pop of color the beanie adds to the look as well. LOL, I saw Emily’s look on IG with her leopard coat, you two are too cute! Thanks for sharing and I hope you have a wonderful weekend ahead! Haha, I will never let her live that outfit down! And thank you, I love a good comfy casual look! Thanks for following along! Hope you have a good weekend too! 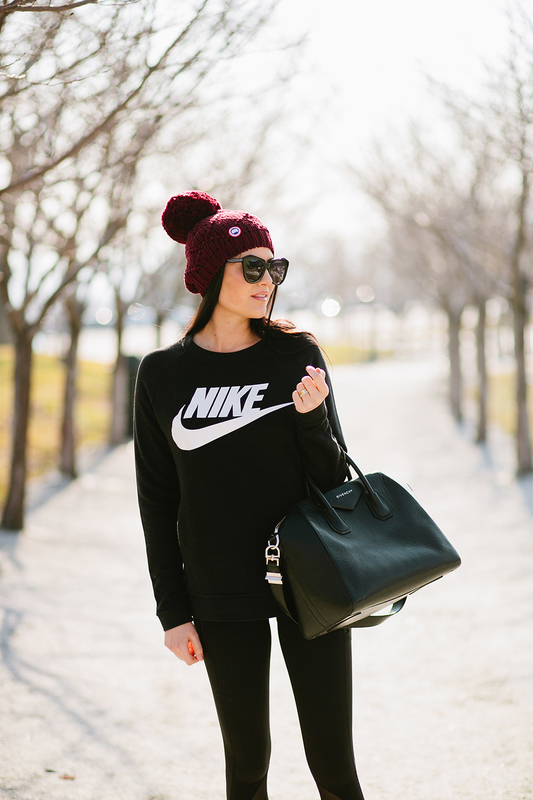 Yessss, love this athleisure look! So perfectly comfy and casual – the burgundy hat is the perfect pop of color. Loving this bold athletic wear look on you! Those sneakers are super cute. You look fab in anything you put on!!! Black is everyone’s go to look,love! Oh my goodness! You are adorable! I love this look- especially the hat. :) This weekend I am hanging out with my parents and my new puppy in my hometown. Hope you have a great weekend! You are so nice, thank you! Oh my goodness, have fun!! That sounds like an amazing weekend! So comfy! Love the sneakers – definitely have to get a pair too! You won’t regret it! They area so comfortable and athletic shoes can be worn with anything nowadays! Love it! I love these leggings, I’ve been really eyeing leggings like that at lululemon recently. My go to are definitely a grey pair I got from there that are so incredibly soft. I’ve worn them to work out in, with a button down over top, with a hoodie. They work every way lululemon’s stuff is great that way. Thanks Taylor! Nike has the coziest sweaters! Such a cute and chic casual outfit!! I LOVE the mesh panels on those tights! Love this look on you! I agree this outfit is perfect for mamas on the go!! Have a wonderful weekend! 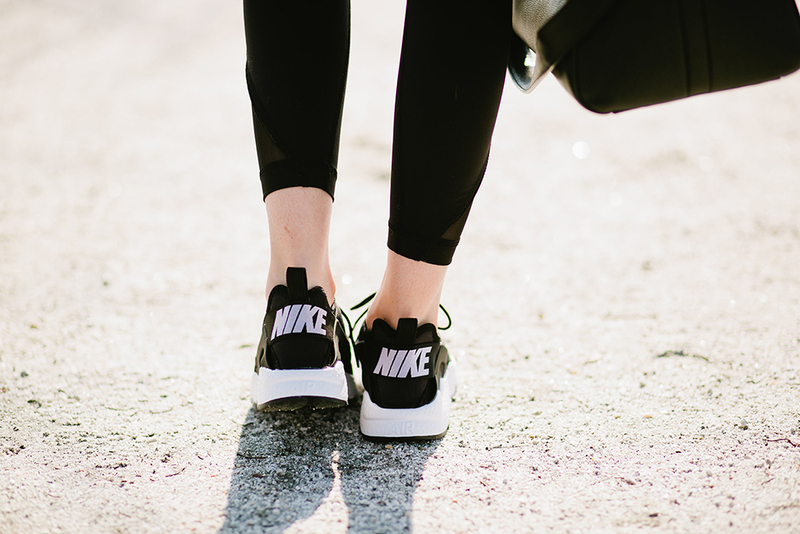 Athleisure is seriously the BEST. It’s so comfy, cute and EASY. What more could you want? Love this look and hope you had an amazing birthday! It really is the best!!! Totally agree :) Thank you so much, you are so sweet! Love the pop of (dark) color in your beanie! Your shoes seem really comfy. Love the outfit it’s perfect for the weekend. Athletic with class. ? I totally understand this go to outfit. Being glamorous all the time at the same time as being a mommy can be hard, I understand. Love this nike sweatshirt also! That hat is such a great color! Love your style.